It was a day for lying in the shade and this rabbit, having no choice about wearing a fur coat, was taking advantage of the Henry Moore statue. It looks slightly like one of Moore's Reclining Figures. 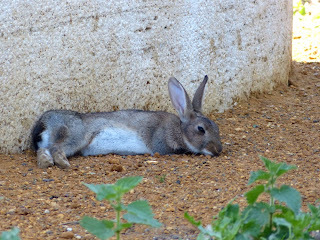 There are now three litters of young rabbits of visibly different ages running around this area. At last the population is recovering strongly. 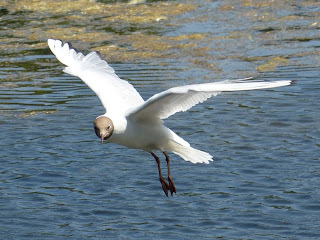 Ten Black-Headed Gulls yesterday, fifteen today: the return begins in earnest. 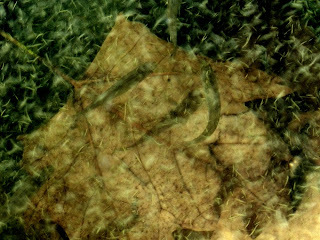 It is strange to be seeing the signs of approaching winter on such a warm summer day. Some of these gulls are permanent British residents, but others come from Holland, Germany, Poland, Lithuania and even Finland to spend the winter in the park, and they tend to come back to exactly the same place. All the Black-Headed Gulls I saw were on the Long Water. The two Common Terns have now taken to fishing in the Serpentine, flying round and round the shore with that easy elastic motion that makes them so lovely to watch. I wondered why they had moved to the other side of the bridge, and had a good look at the water. They young fish are now two inches long, as you can see by comparing them with this plane leaf: quite large enough to be interesting to terns. They are also exactly the right size for feeding to newly hatched Great Crested Grebes. Let's hope we see a better late breeding season than the disappointing earlier one, from which only one young grebe has survived. I saw it today under the bushes at the east end of the island, which is where the nest was. 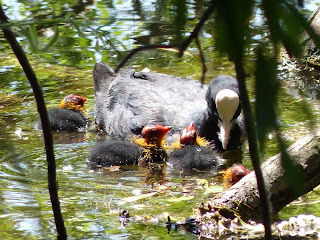 The Coots at Peter Pan have also lost one of their two chicks. There were some Lesser Black-Backed Gulls circling hungrily over their nest, and the parents had the sense to chivvy the surviving chick into the nest, while a family of Mallards -- down to to from five the last times I saw them -- foolishly remained out in the open. But one of the pairs of Coots nesting under the willow tree near the bridge have just hatched four chicks. They were being kept safely under the tree. No sign of any of the owls today. A Reed Warbler is still singing in the reeds at the Diana fountain.